In retaliation for refusing to let Mastercard customers donate to Wikileaks, 4Chan-based hackers and the Internet vigilante group Anonymous have successfully taken down the website of Mastercard.com with orchestrated DDOS attacks. The Anonymous-backed Operation Payback which is taking responsibility for these attackes, has also lead previous efforts against the RIAA. Operation Payback is organizing its WikiLeaks and Julian Assange support efforts through the @Anon_Operation Twitter account and here. 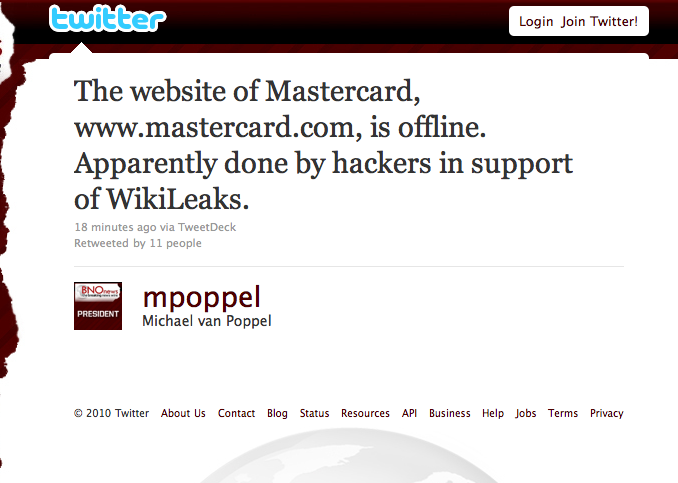 Attacks have also hit Paypal and Swiss bank PostFinance and other sites which have refused service to Assange. EveryDNS.net, Visa as well as Amazon are also possible targets. Assange himself was arrested in London yesterday under allegations of sexual mis-conduct and will be held in custody until December 14th. It remains to be seen how the WikiLeaks saga will play out, but it is very obvious that the entire Internet will be the battleground.